↑ Donahue, Wendy. "Michelle Obama emerges as an American fashion icon". Chicago Tribune. Retrieved June 4, 2011. 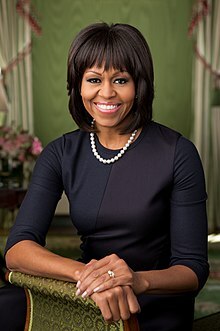 ↑ "Michelle Obama settling in as a role model". The Washington Times. Retrieved June 4, 2011. ↑ Slevin, Peter (March 18, 2009). "Mrs. Obama goes to Washington". Princeton Alumni Weekly. 109 (10): 18–22.